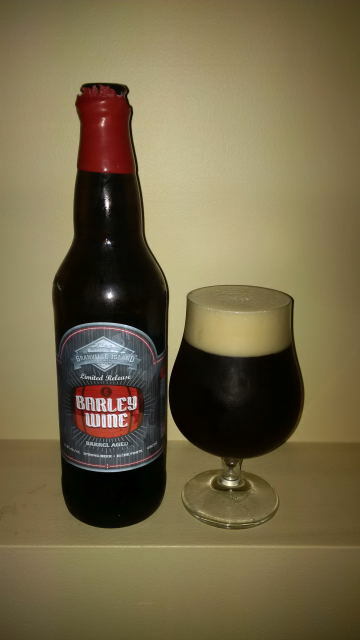 From Granville Island Brewing located in Vancouver BC comes their Winter seasonal “Barley Wine 2012” the breweries first Barleywine that I have cellared for a full two years. The beer pours a deep cloudy brown with a tan head. With most cellared beer you will find sediment and this is no exception with lots of it. The aroma consists of very malts, dark fruits and mild hops bitterness. The flavour is of chocolate, caramel, dark fruits, oak, vanilla, bourbon and very mild hops bitterness. There is very little alcohol warmth present and everything has really smoothed out. To say this is a great barley wine would be an understatement now! The alcohol content of this beer is 11.5% with an IBU of 60. Commercial Description: The typical barley wine may find its origins in English ale, but there’s nothing typical about this special brew. Aged in Bourbon barrels, you’ll find strong caramel malt character, vanilla and oak flavours with a healthy dose of pacific northwest hops. Cellar the beer and enjoy for up to five years, but if that’s too long, you can always try it tonight. 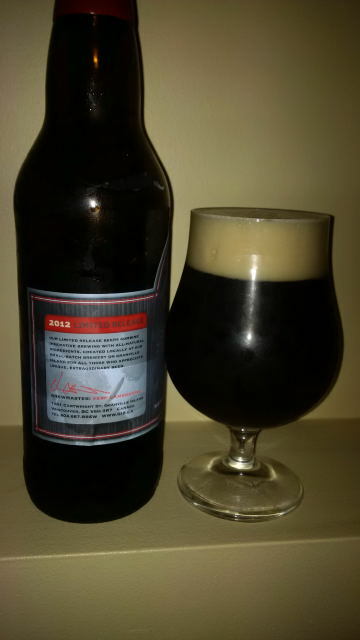 This entry was posted in Barleywine Ale, Barrel Aged, Imperial and tagged 2 years aged, 2 years cellared, aged, barley wine, barleywine, bc, bourbon, canada, caremel, cellared, chocolate, craft beer, dark fruit, dark fruits, granville island, granville island brewing, mild bitter, mild bitterness, mild hops, oak, smooth, vancouver, vanilla, winter seasonal. I believe I still might have a bottle of this vintage somewhere! So, would you say drink now or hold longer? It may get better but I don’t expect it to get much better. It is pretty epic currently. I remember REALLY enjoying the first bottle I tried – so I think I’ll be cracking mine soon on your recommendation. Thanks! I was excited to see they have some cellared 2012 apparently ready to sell at the brewery! Will have to check that out. Hmm. Wonder if that means this years is close? Maybe they will do a three year vertical package like the 2 year one last year.